Angola this week started negotiations with the IMF for financial support, pushed into the arms of the multilateral lender by a crash in the price of oil, on which it depended for more than half its government receipts. It is usually a painful process—in exchange for its help the International Monetary Fund usually requires disciplined reforms, which often include cuts in spending, hurting the incumbent regime’s standing with voters. The southern African country in 2012 emerged from a three-year $1.4 billion plan with the IMF, which helped stabilise its debt position and strengthen its international reserves. Luanda, which is often accused of being opaque, is now promising to toe the line , after its state oil and gas company reported $14.38 billion in 2015 earnings, 34% lower than in 2014. Oil accounts for 95% of its export earnings. “There is a strong belief within the government that the continued drive towards enhanced transparency can be accelerated by partnering with an institution like the IMF,” the government said last week. In its latest economic outlook , the IMF projects the economy of Angola—the continent’s second biggest oil producer— will grow just 2.5% this year, falling from 3% posted in 2015. The continent’s biggest oil producer, Nigeria, will see its economy grow 2.3% this year, the IMF projects, continuing a reversal that saw it expand 2.7% last year. In 2014, its economy grew 6.3%. Oil prices have fallen more than 70% since June 2014, with few willing to bet their house on a substantive recovery any time soon. Another oil producer, Equatorial Guinea, last year saw its economy shrink 12.2%, while Sierra Leone contracted a staggering 21.5%, following its battle with the Ebola fever. Such reversals inform the gist of the IMF’s cloudy outlook, in which positive messages are scant. M&G Africa looked at 10 key messages that hold some import for the continent’s economy. Growth in sub-Saharan Africa is projected to reach 3% this year, half a percentage point lower than in 2015. Last year, the IMF forecast the region’s economy would grow 4.3%. “The ongoing slowdown is driven by unfavourable external conditions: resource-intensive countries have suffered from the decline in commodity prices while the region’s frontier markets are adversely affected by tighter global financing conditions,” it says. 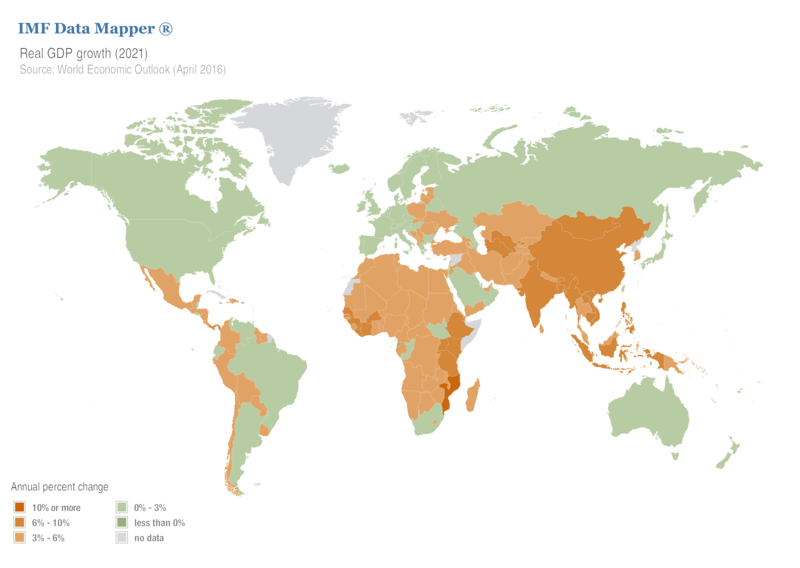 However there is a ray of hope—growth is projected to tick up to 4.0% next year—above the global average. Migration and the fear of terrorism are also affecting the global economy, while processes such as the UK’s planned referendum on its membership to the EU could disrupt trading relationships, further depressing world commerce. Perhaps no single country has roiled the world economy as much as the Asian country, now the world’s largest economy on a purchasing-power-parity basis. It is a top 10 trading partner of more than 100 economies—which all account for 80% of world GDP—including a sizeable number in Africa. Beijing’s ongoing rebalancing from a credit and investment-led economy to one focused on services and consumption is keenly tracked all over the world. The success of this could head off a generalised global slowdown. China’s economy grew 6.9% last year, in 2016 it will fall to 6.5%, and 6.2% in 2017, the IMF forecasts. It could get very nervy. IMF figures show that for the countries where energy and mining exports accounted for a larger share of GDP, investment growth was notably weak during 2014-15. A large number of African commodity exporters would solidly fall here. With commodity prices projected to remain low—investment in oil and gas in major energy exporters for example fell 24% last year—these countries will need to make “sizeable adjustments” to their domestic spending. Even major oil companies are learning, the report notes—they are increasingly diversifying into natural gas and renewable technologies. Amid all the hand-wringing in oil exporters, the IMF notes that oil prices have somehow firmed, giving hope to exporters even as clean energy becomes the buzz word. But in the meantime, another effect has been more important. “On the upside, the recent decline in oil prices may boost demand in oil-importing countries more strongly than currently envisaged, including through consumers’ possible perception that prices will remain lower for longer”. China’s demand for oil in 2015 was certainly brisk and steady. Add to that the demand growth by the global emerging middle class for transportation services—for which oil finds most use and you wouldn’t write it off just yet. In addition, the IMF notes that the disappointing performance of the global economy over the past year has led some to question whether an oil price decline is truly a shot in the arm for world growth. In other words, a case can be made for higher prices, especially after inflation and a strong dollar cut benefits for importers, meaning there may still be life left in oil, after all. Ivory Coast, Kenya, Rwanda, Senegal and Tanzania have all been pouring money into infrastructure, and notching up strong consumption numbers. As such, they are all expected to grow at quite impressive rates of between 6-7% or more this year and next. There are seemingly many ways to skin the economic cat. Last year Ethiopia was the world’s fastest growing economy, banking growth of 10.2% (it’s reporting year runs between July and June). But the Horn of Africa country is currently battling its worst drought in 30 years, with a fifth of its approximately 100 million people in need of food aid, with the rescue bill estimated at $1.4 billion. The adverse weather is linked to the ocean-warming effects of El Nino. As a result the IMF says, Ethiopia’s economy will this year decline substantially to 4.5%—it had projected 8.1% this year—with recovery to 7% seen in 2017. The country over the last decade posted average growth of more than 10% annually. Prime minister Hailemariam Desalegn is however holding out , projecting growth of between 7-10% this year. A major risk to the global economy this year is the “self-confirming negative feedback loop”, the IMF says. Essentially, a return to financial turmoil impairs confidence and demand, cutting investment and trade, reinforcing itself in a never-ending cyclical loop. A sharp slowdown in China could for example have strong effects on among other factors global confidence, further hurting expectations of future income. “If national policymakers were to clearly recognise the risks they jointly face and act together to prepare for them, the positive effects on global confidence could be substantial”. It is a really important premise of the report—the word appears at least a dozen times in the opening chapter. The IMF released its risk-assessing Global Financial Stability Report on April 13, sub-titled “Potent Policies for a Successful Normalisation”. Noting that the economic outlook has deteriorated due to everything from uncertainty to declines in prices, the lender is calling for a “broad-based policy response” to stabilise the world economy, or risk market turmoil. It’s tough for everyone: the world’s growth this year also been revised downward to 3.2%, from 3.4%. Weak recovery to 3.5% next year is expected. But sub-Saharan Africa’s growth is expected to pick up to 4% in 2017, helped by a recovery in commodity prices—but also significantly, timely policy intervention. This will help lift the overall world economy, the IMF says, while helping offset the effects of China’s dominant role. Last week, the continent’s economic technocrats and its economic and finance ministers huddled together in Addis Ababa to craft solid policies for the continent’s growth. The resolve at the African Development Week was apparent.